1. Birthdays are something worth celebrating! If I love someone (including myself), I want to acknowledge that person’s existence on this planet and what better day then the day they were born. 2. Autumn is my favorite season because it has my favorite holiday, the leaves are gorgeous and the air has a certain tangy chill to it. 3. I feel my best when I’m happy and not under a lot of stress. 4. Lately, sourdough toast is my favorite food! 5. First impressions are sometimes not the best thing to base an opinion of a person on. 7. And as for the weekend, tonight I’m looking forward to being incredibly lazy and possibly reading a good book, tomorrow my plans include going to a yard sale and Sunday, I want to be able to meet up with Lauren for lunch and to enjoy another day off from work! Questions courtesy of Jennifer this week; thanks, Jennifer! It’s Cancer the Crab, my astrological sign and this is one huge mug! I mean…I could drink a rum & coke outa this sucker! It’s more of a flagon! But I love it. Thanks, Azzy! Incredibly lazy definitely has its time and place! I am the only one in my family that loves sourdough bread…of course I am also the only one that can divulge in a mincemeat pie too! Big mugs are the best to drink hot chocolate from – more room for the marshmallows! I LOVE your answer for advice. I am going to use that with my children! Thanks! Many blessings to Nana for saying such a smart thing. Sourdough toast sounds good. I like Italian or Canadian bread toast. Your weekend sounds like fun. I love yardsales myself so I hope you find something useful, like that book you want to read this weekend, or maybe next. I like the coffee mug idea entry. Later on I will post something, right now I am off doing errands. Big mugs are best. Not sure if I could drink from one decorated with 69 though. my lunch today? sourdough toast! Fall is my favorite time of year also, but I hate what follows. 1. Birthdays are for celebrating. 2. Summer is my favorite season because it is now. 3. I feel my best when my legs get their monthly shave. 4. Anything edible is my favorite food! 5. First impressions are before learned opinions. 6. The best piece of advice I ever received was take deep breaths. 7. And as for the weekend, tonight I’m looking forward to doing as much nothing as possible, tomorrow my plans include doing the same as Friday night and Sunday, I want to go get my Jesus on! Sourdough toast? I need to try that! mmm..sourdough bread. Totally agree with you about autumn and I’m never bored either. oh i am SO going to use your nana’s comment on the roo-girl!!!!!! I liked your answer to number 5, it’s so true. What a pretty mug — where did she get it? I never thought about being bored like that, but that’s really funny. Oh man…that reminded me of one time I bought some “sourdough” bread at a store here….or at least that’s what the sign said. got it home, took out a piece and….no…nope….not even close. WTH I wonder did they think they were making?!?! and…my granny said almost the same thing…”there are no boring situations, just boring people”….I too never said “i’m bored” around her…ever!! I solved the “I’m bored” comment with my kids, if they said it, I put them to work! But I love your nana’s comment because you remembered it and it stuck! Sounds like a wonderful way to spend the weekend!! And thanks for posting your favorite mug! I love it!! I totally agree with your #1 — birthdays should be celebrated! Oh, I LOVE your answer to #1. It’s the perfect birthday attitude. 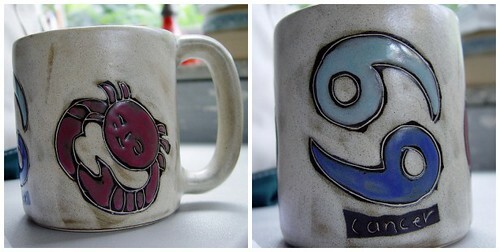 Your mugs are so cool. I’m having mug envy. OMG, I LOVE that mug!! Think you could find out where she got it and if they have a place to order online? I think I need a Pisces one…I neeeeeeeeeds it, my precioussssssss. I love your answer to #1 too!! And your Nana’s advice is pretty much exactly what my dad always told me. One of his pet peeves in life is to hear anyone claim to be bored. Autumn is a nice season with beautiful colors but it’s rather rainy where I live ! And reading a good book is one of my plan for the weekend too Have a nice weekend ! As a fellow Cancer, I must say I LOVE the mug. And, I totally agree with you about fall, best food, best weather, favorite holiday. And, the colors of fall are divine. Happy Friday, and enjoy your weekend of relaxing. LOVE those mugs…where did Azzy get them? I think being lazy and reading is a perfect thing to do on a Friday! I have to admit the birthday card you sent me last year did help a bit- ! But with Christmas exactly a month away from my birthday- most years I’m much more likely to be worrying about having enough money for the kid’s Christmas gifts than giving myself a birthday gift! Hi Janet…happy belated birthday…sorry I’m just telling you now, I have a new family member on board and I’ve had my hands full (see me blog for info). Hope you’ll forgive me for just telling you happy b-day now…you are special to me always! I posted my Friday fill-in. What great answers! Hope you have a great wkend!! You’ve got a great weekend lined up there. Going to yard sales is one of my favorite things to do! Have fun. I love autumn, too – for that brisk weather and also because it’s football season.